Yet another Los Angeles Historic-Cultural Landmark that isn’t there anymore. However, HCM No. 18 has the dubious distinction of being the first landmark to bite the dust after the declaring process began in August, 1962. According to McGrew and Julian’s Landmarks of Los Angeles, Capt. and Mrs Fred B. Clark donated land at the turn of the last century for the church. It was razed in 1964. The congregation’s website says the old church was dedicated March 10, 1901, but the following Los Angeles Times article from February 11, 1901, reports dedication ceremonies were held the previous day, respectively. Dedication of the Hyde Park Congregational Edifice Yesterday Afternoon. A Memorial to Cora Clark. The pretty edifice henceforth to be known as Hyde Park Congregational Church was dedicated yesterday with suitable ceremonies. The church has a main auditorium with 50 seats, besides a Sunday-school room and gallery, which hold fifty additional. It is a neat frame building, with Gothic windows and natural pine ceiling. There are a pulpit, choir platform, concealed baptistry and pastor’s study. The exterior is attractive, the roof having two towers. At one side of the church is a beautiful window, costing $100, placed there in memory of Miss Bertha Leuzinger, a former worker in Endeavor Society, who died two years ago. The Hyde Park people have been holding services for twelve years in the school building, and since 1890 Rev. J.M. Schaefle has presided as pastor, holding a Sunday-afternoon service there, as well as a Friday-night meeting. 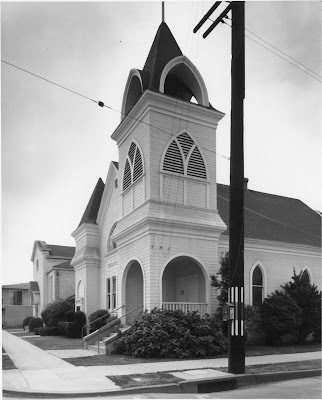 During this time Mr. Schaefle has also presided over the congregation of the Pico Heights Congregational Church, holding four Sunday services there, as well as one week-night meeting. The preacher will continue to serve both charges. You know, you just don’t see the L.A. Times referring to a “pretty edifice” that much these days. Or anyone else, for that matter. The current facility opened in 1965. The photo's from the city's Department of City Planning website. I attended Hyde Park Congregational Church as a child, my best friend was married there in 1962, where I met my husband to be. It has been so long, and the fond memories of the church still hold a place in my heart. I was so delighted to see the pictures of the church.